The Washington state technology industry is booming. The state is home to giant tech corporations such as Microsoft and Amazon, and it has the highest concentration of software companies in the country. This prosperity is expected to continue and estimated to increase the state’s science, technology, engineering, and math, or STEM, economy 24 percent by 2018. A similar trend is expected nationwide. Today, 20 percent of all jobs across the country require a high level of knowledge in a STEM field. Experts predict that these fields will be among the country’s highest-growth industries in the years to come. Less well known is that knowledge of STEM fields is important not only for highly educated workers, but also for those without a college degree. According to the Brookings Institution, “Half of all STEM jobs are available to workers without a four-year college degree, and these jobs pay $53,000 on average—a wage 10 percent higher than jobs with similar educational requirements.” Even “blue-collar or technical jobs in fields such as construction and production … frequently demand STEM knowledge.” Moreover, employers report that “mathematical knowledge will be either very important or extremely important to success” in 70 percent of jobs. In other words, the demand and reward for workers who are skilled in critical thinking and problem-solving is rising, while the number of opportunities available to workers without these skills continues to decline. Unfortunately, the U.S. public K-12 education system is not preparing all students to seize opportunities for challenging, well-paying jobs. Recent projections warn that if current trends continue, there will be 5 million unfilled jobs by 2020—largely because prospective workers lack the requisite skills. A recent survey of employers by the Association of American Colleges & Universities found that the majority of employers do not feel that “recent college graduates are well prepared,” particularly when it comes to critical thinking skills. Meanwhile, other countries do a far better job of readying their students to be competitive in today’s job market. According to the most recent data from the Programme for the International Assessment of Adult Competencies, or PIAAC, adults in the United States have “very poor” numeracy skills. In fact, out of 24 countries, American adults scored higher than only two, and nearly one-third of adults demonstrated below basic mathematics skills. The opposite is true in other countries. Approximately 20 percent of adults scored at PIACC’s highest levels in Japan and Finland, compared with less than 9 percent in the United States. American high school students also perform far below the international average in math. Currently, they rank 27th in mathematics, while Korean and Japanese students lead the world. Between 2003 and 2012, the average math score in the United States actually decreased 2 points, while Korea’s shot up 12 points. Even the most affluent American students scored significantly below the average score of other countries. For example, American students in the highest economic quartile scored 81 points lower than the average student in Shanghai, China. The Common Core State Standards—which 43 states and the District of Columbia currently use—were developed to address these problems. Through the Common Core, students are taught to understand both the procedures for doing math problems—such as memorizing multiplication tables or learning to “carry the 1”—and how and why these procedures work. This approach allows students to more deeply understand the concepts that underlie mathematics, improve their critical thinking skills, approach problems from different perspectives, and apply what they learn to real-world problems. In other words, students will study why 5 x 10 = 50 in addition to memorizing multiplication tables. 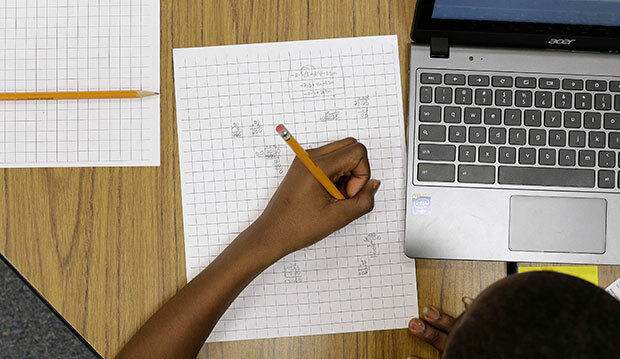 The Common Core math standards represent the culmination of decades of research into how students learn and are an extension of 30 years of standards and curriculum development by the National Council of Teachers of Mathematics, or NCTM. Ultimately, learning math this way helps students progress through advanced math while in school and better prepares them for a wide range of careers, particularly those in high-growth STEM fields. As with any shift in pedagogy and practice, however, it will take time for educators, parents, and students to become accustomed to this approach to mathematics. This being said, patience and faithful implementation of the standards will pay dividends. Students in states that adopted the Common Core early, such as Kentucky, have begun to make important progress. According to a study of student performance on the ACT—a common measure of college readiness—conducted one year into the implementation of the Common Core and again two years later, students in Kentucky made gains that amount to an additional three months of learning. The key is staying the course, providing high-quality and continuous professional development and support to teachers, and routinely communicating with parents about what their children are learning and how it prepares them for college and careers. The traditional method of mathematics instruction has focused on rote memorization and procedures that have not led to a deep understanding of the concepts that underlie math. Without a deep understanding of mathematical concepts, American students struggle to problem solve effectively and to apply their skills to real-world situations. Students who are taught to conceptually understand math outperform students who are taught to use the traditional algorithmic approach. In order to achieve mathematical fluency, students must learn to make connections and draw conclusions from new material. Conceptual math allows them to do this. States should stay the course with Common Core standards and aligned assessments. Through perseverance, the nation can improve the quality of mathematics education for all students. States and districts should provide teachers with additional, dedicated time and professional development opportunities. High-quality, ongoing, and readily available professional development allows teachers to internalize the standards with the help of effective instructors. States should also develop a standards translation guide for teachers. Districts should communicate regularly with parents and provide training and resources. This helps parents support their children as they learn conceptual math. States and districts should review curricula and instructional materials to ensure that they are high quality and aligned with and supportive of Common Core math. By doing this, schools can ensure that students are being taught effectively. Teacher preparation programs should incorporate conceptual mathematics into curricula. Future teachers should also be trained to instruct students in conceptual math. Shifting to math education of this caliber and depth is difficult and will likely challenge both teachers and students. States must support educators as they become fluent in and adapt their practices to ensure that students engage meaningfully with math and learn to think beyond simple formulas and processes. Otherwise, American students’ math performance will continue to slip below what the global economy requires. Max Marchitello is a Policy Analyst for the K-12 Education Policy team at the Center for American Progress. Catherine Brown is the Vice President of Education Policy at the Center.